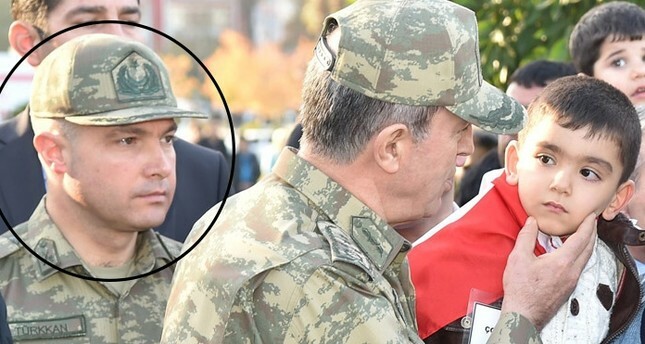 Lieutenant Colonel Levent Türkkan, the aide of Chief of General Staff Hulusi Akar, who was detained under the scope of the failed coup attempt, confessed that he is a member of the Gülenist Terror Organization (FETÖ), which he said was behind the deadly July 15 coup attempt. According to testimony records, Lt. Cl. Türkkan actively participated in the coup attempt, which was carried out by FETÖ members within the military. He said that Major General Mehmet Dişli, who also took part in the coup attempt, is a member of FETÖ. "On July 15, I went to Major Gen. Mehmet Dişli's room, he is a Gülenist too. He told us that he would ask Chief of General Staff Akar if he would like to be 'Kenan Evren or not," Türkkan said, and added that Dişli expected Akar to accept the offer. He continued by saying that Akar and other force commanders declined. Hulusi Akar reportedly kept telling Türkkan and his partners that they were 'making a mistake,' until he was taken by Special Forces. "I stayed there, and Gen. Dişli called me to tell me to call Gen. Akar's wife" Türkkan said, and added that Hulusi Akar's wife burst into tears when she heard the news. Türkkan claimed that he regretted participating in the coup when he learned from TV that the Grand National Assembly of Turkey was being bombed and civilians were being killed by junta troops. Speaking about his background, Türkkan said that he comes from an impoverished family and met with the Gülen Movement during adolescence. He confessed to being a member of the Gülen Movement, and said that he started acting based on the orders of Gülenists after he started working at the adjutancy. "Since I was five, my biggest dream was to become a military officer" he said, and added that he entered the military school entrance exam in 1989. In his testimony, Türkkan noted that he was sure he would pass the exam as he was a bright student with high marks and dedication, but the Gülenists gave him the answers to the exam in a house belonging to them in Bursa province, the night before the exam. Türkkan also said that he used to wiretap former Chief of Staff Necdet Özel on a regular basis, upon orders by the Gülenists. He noted that he would deliver the wiretapping device to a Gülenist working for Turkish telecommunications authority on a weekly basis. "I used to put the wiretapping device in Chief of Staff Özel's room every day, and would take it back at the end of the day" Türkkan said, and added that he would refrain from putting the device in Özel's room on days when the room was searched for wiretapping devices, as he was informed when these would occur.